I think it is time to draw Cartoon Saloon into the company of the great animation studios of the modern day. It's not just that with The Breadwinner, a sober-minded tale of the life of a girl in Afghanistan during the height of Taliban control, makes it three-for-three good or great features from Cartoon Saloon, and all in a striking aesthetic that stands out from virtually everything else in world animation right now. It's that The Breadwinner is the first of those three films not directed by Tomm Moore, and so is the definitive proof that the studio has the stuff to survive the absence of its founding auteur (e.g. it's not another Studio Ghibli). The project is still, as it were, all in the family: director Nora Twomey, making her solo debut, has been intimately involved with the studio's output thus far: co-director duties on 2009's The Secret of Kells, story head and voice director on 2014's Song of the Sea. And Moore is still on hand as The Breadwinner's producer. But the point, I think, stands, particularly given how much of a decisive break The Breadwinner makes from those two films, as a narrative and even a little bit stylistically. The film has been adapted from a 2000 children's novel by Deborah Ellis, who co-wrote the script with Anita Doron; it's the story of a family in Kabul quietly eking out an existence sometime in the 1990s, doing their best to lay low. Both parents are in bad shape: father Nurullah (Ali Badshah) lost one of his legs during the war against the Soviet Union in the 1980s, and mother Fattema (Laara Sadiq) is apparently just worn out from a long, hard life. Nurullah pulls in a small living selling odds and ends in the market, and offering translations as both reader and writer; to help pass the days, he brings along middle child Parvana (Saara Chaudry), still young enough that Nurullah isn't arrested on the spot for bringing a woman out into the open air for all the world to see, but old enough that she's begun attracting unwelcome attention from some local Taliban soldiers who've happily bought into the idea that the onset of puberty is the right time for marrying. And it's exactly one such run-in that sets the plot off: one particularly nasty soldier figures out that Nurullah's indulgences towards his daughters plays pretty fast and loose with the fundamentalist rules the Taliban has impressed upon the country, and so arranges to have the man arrested. This spells ruin for the family: the rules say that women can't go out to perform even the most banal, quotidian business without male accompaniment, and now Fattema, eldest daughter Soraya (Shaista Latif), and Parvana are stuck in the house, with the sole male in the family a babbling toddler. The solution is the Mulan option: she's young enough to pass as a prepubescent boy, and so she can go out and buy food and continue her father's work as a translator. And thus kicks off a singularly striking little drama about surviving by any means necessary in the face of vicious totalitarianism, a quiet domestic adventure film designed to teach quick-witted, patient children about the history of fundamentalist Islamic political movements and their repressive views on gender. A hefty theme, as children's movies go, and I am inclined to say, one that the filmmakers deal with in a smart, sensitive way. It's a crisp, clear-eyed movie, in which sentimentalism is sometimes employed as a tool by the characters but never by the filmmakers; though it refuses to go all-in on the crushing brutality that a story like this would include if it were, say, a live-action art film, The Breadwinner isn't looking to soft-pedal the treatment of women under the Taliban, including a scene where Fattema is beaten (for most of the rest of the film, her face and feet are covered in nauseatingly well-rendered bruises), and the hanging spectre of the Kafkaesque prison where political dissidents are disappeared substantially drives the plot. Such a very long way we are from the delicate Celtic fantasies of Cartoon Saloon's previous work, and not always for the best. Fantasy can get at truth just as well as frank realism, after all, oftentimes better; The Breadwinner even makes that part of its plot, splitting off at regular intervals to dramatise the folktale Parvana tells her little brother about a heroic boy who sets off to save his village from a tyrannical elephant king. It doesn't take a literature scholar to see that this is a metaphor for Parvana herself, though the film happily refrains from over-stressing this, or even clarifying whether the girl is aware of the metaphor. It is, at any rate, a substantial, morally complex, excitingly sophisticated narrative for a kids' film (enough so that you'll see people casting about, calling this an animated movie for grown-ups - nope, as much as I'd like to see such things get produced in the anglosphere), even with its collapse into frantic anarchy in the last 25 minutes or so - not a brief fraction of a 94-minute film, either. 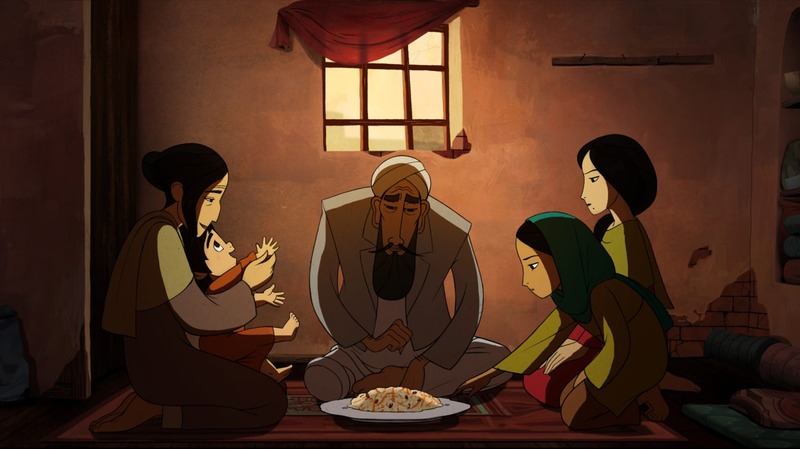 Regardless, I'm not at all sure that 2017 has witnessed a more complete and perfect act of storytelling in an English-language animated film, and on that count, I'm happy to say that The Breadwinner stands tall with its two big siblings. That's less true, sadly, on aesthetic grounds. Like Song of the Sea, The Breadwinner has been animated using the TVPaint Animation platform; unlike Song of the Sea, it puts absolutely no effort into combating the limitations of that software. The result is a film that looks exceptionally clean and sharp, with perfectly-formed character designs - adapting the studio's round, bright house style into a more realistic environment without missing a step - and characters who movie like glassy ghosts. I'm sorry, it's the whole Flash-style animation thing; I hate the Flash-style animation thing. It's very good for creating characters who move weightlessly and don't have very much rubbery flexibility. Song of the Sea, which embraced a flattened quality derived from Celtic graphic arts, was able to work with this. The Breadwinner, which has nothing to do with anything Celtic, and not much to do with the graphic arts, is much less so. It's certainly not an accident that all of the most visually interesting parts of the movie are Parvana's stories, when the action shifts into CGI versions of paper cut-outs marching across ruthlessly foreshortened backgrounds; it feels like folk art come to life (though not, as near as I can make out, specifically Afghani folk art), and as such is a much more comfortable fit for the all-folk art, all the time vibe of the studio's earlier work. This is at least partly nothing but a quibble; even with the most unexciting character animation in Cartoon Saloon's brief history of features, The Breadwinner still manages to be one of the best-looking animated films of 2017 - Cartoon Saloon's circle-dominated style is just about as easy on the eyes as it gets - and "one of" really just means that Loving Vincent happened this year, and set that bar unrealistically high. That, combined with its gripping human drama, makes it as worthy of your time and attention as any other animation I've seen in quite a long while; improvable, yes, but tremendously enthralling even in its imperfections. It's a beautiful mixture of elegant cartooning and harsh human reality, of bold childlike colors and a sobering depiction of childhood ending. It's heady, wonderful, heartbreaking stuff.